School leaves fond memories once you’ve passed out of its hallowed portals. Till then, many wait for the day they’ll be out of its gate. Not for us, though. School was always a place I’d long to belong. It never fails to make me nostalgic. It has even reunited us, Josephites of the 1991 batch. St. Joseph’s still has that charm, an aura of exclusivity, though I’d apologize for sounding snobbish even while I am not. Everything about it has personality, be it the three playgrounds, the famous Tamarind tree, the huge gulmohars, the cellar, the Chapel, the drawing room on the fourth floor, the nuns or even the teachers. The school itself has a personality, a unique identity very few can boast of. It is so much like a grandmother who is surrounded by children, who keeps smiling and touching these kids with affection. Back in 1980 when my father chose this school, he must have known all of this, for he was a man of vision. I recall Sr. Annie interviewing me and I was just having a jolly time of my own. I still don’t know what made her grant me admission! It remains a feat to this day to get in this school because you get in on merit and nothing else. Mother Pasquinha was the principal then and somehow, inspite of her Italian origin, her tall fair matronly figure, we were never afraid of her. I, all of 5, would frequently enter her cabin to run some errands for my teachers and she’d hand me some chocolates. St. Joseph’s has had a lovely run of 125 years all thanks to its selfless nuns, the extraordinary teachers, students who never forgot the sanctity of school and alumni like us, who’ve cherished memories. What started from small tiled buildings is now a huge institution. Back then, apart from our school, there was the Kannada medium school till Std. 7 and the Teacher’s Training Institute. The Kannada school had, behind its building, a much sought after wood rose plant. I have got hold of those lovely flowers many times. A good school has all the infrastructure- the hall, the grounds, the labs, the works, but schools that are fondly cherished also have a distinct feel – one of security, one that fosters growth, teachers who command respect and are not feared, steps, corners, benches that allow friendships to bloom, security for a child who leaves the mother’s hand and enters, opportunities for everyone to learn and develop, exposure to the best knowledge of the world, the desire of those in charge to provide everything that shapes lives. I can recall all of these things in my school. Teachers like Ms. Kamal, Ms. Tawamani, Ms. Shastri, Ms. Gouri, Ms. Kanti, Ms. Farida who made science so easy that even today I remember her dictation, Ms. Benjamin who worked with us till we got that perfect cursive handwriting ( and hence, almost all Josephite’s of my time have identical handwriting) and my favourite, Ms. Philu, whose knowledge and zest for all things beautiful filled young girls’ minds with dreams and the strength to make them possible. I don’t remember a single episode when we had problems during picnics, school annual days or sports meets. Everything used to be well planned, well executed. My parents rarely had to shell out any money for extracurricular activities, for they’d be managed by school. All we spent on was the craft stuff, the dress for the annual day or the picnic fees. In middle school, we had Sr. Bridgette as our principal and then it was the vivacious Sr. Rose, who was a powerhouse in her frail frame. Many would recall her penchant for a well kept garden when she’d observe the gardener from our XA class and yell a loud ‘Basssuuu’ from two floors above to instruct him. She was instrumental in planning for the centenary celebrations in 1991 when we were in the Xth. We missed our annual picnic for that event, but we enjoyed the two day ceremony. It was Ms. Margaret Alva who was the Chief Guest and we had some performance that day. There was a special commemorative magazine published and a special centenary song as well, written by students. St. Joseph still has its Social day and Passing out parade. The Social was a special one, and I’d hosted the one for my seniors. ( The IX std. students hosted Social for the Xth ). It was when they wore sarees and came out in all their finery. I still have that photo of mine when I’d worn a saree for the first time. St. Joseph’s was always famous for Volley ball and then when the spanking new basket ball court was built, the girls went on a winning frenzy. All my memories of my days in school are as vivid as yesterday in my mind. I somehow loved the pink Tincture iodine in the office and forgot the pain when Ms. Julie applied it lovingly to every child who hurt herself with as much affection. I loved to peek into Ms. Tavamani’s room on the third floor whenever it was open, I loved the brilliant Dahlias that crowded the circular garden at the entrance, I loved the three grounds that served different purposes, so did I love the canteen in the corridor besides the tamarind tree where I’d had some great popcorn and rewdis, the piano in the hall, the wooden railings of the main stairs, the many steps, trees, the warm ambience. 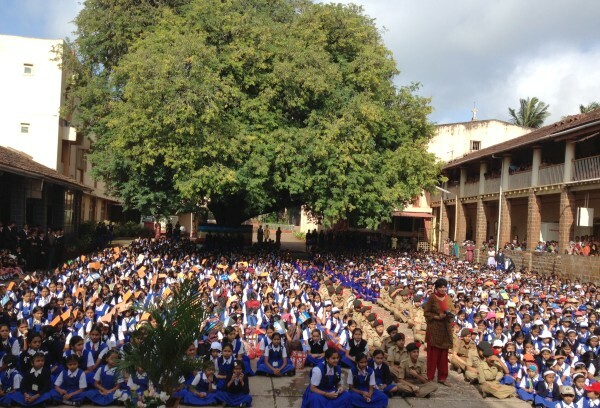 The school celebrates its post centennial silver jubilee this year. For us Josephites, it’s another milestone, a piece of cherished memory. May the institution flourish, may its students bring glory to it and may it be a harbinger of education for the nation. School was the best time in my life. Although I was a rebel and naughty child this school made me who I am. Ms.Tavamani’s affection, her guidance showed me what fun and sports was all about. She loved Kala Kand the sweet and I got lots to eat too. The friends I made are still my friends. The school gave us wonderful teachers. Ms.Shastri, Mrs.Helen, Ms.Saroj whos drawings took us places, Ms.Nirmala who always broke out in a smile. Ms.Kamalaxshi who taught us math and made it easy as pie.Ms.Lorraine who sang ‘Killing me Softly” in class and we sat in rapt attention listening to her with our mouths open. I played in the volley ball team, was a good high jumper and loved jumping to pick tamrind or throw a stone to get some. I was lucky I had both my sisters in school Ila and Alka.. All the teachers and best friends made have left their mark on our lives. Azmi Kapadia was my BFF, Ramona D’souza my confidant and friend. So many many happy memories. All I can say we were lucky to have had such a good education, with experiences that have made us good citizens – and yes thank you for writing such an interesting article. Did I forget to mention St.Pauls which was the boys school and a good distraction for the naughty ones. …. What an article !! All memories just came gushing in while I sit at the New York bus terminal waiting .. Those were the days. .Could relate to almost everyline written here .. Not to mention the cellar in the basement of the church which was so heavily crowded during lunch in rainy season ..and the words by Miss Merlyn 'now is the hr for us to say good bye ..' during the passing out parade .. Thank you for getting me back to these wonderful memories !! @Sanjay, Swati writes articles, not news pieces. Yes, sometimes it is lengthy, but the subject demands details. Swati writes too long & lengthy! That said, this article did bring in great memories that I myself had at my own school, The St. Pauls and I could write volumes in recollection of the wonderful nostalgic school days.